Sometimes I see things around town and I am filled with so many questions...but no way of finding out how to get the answers. Here are some of my questions about the mysteries of Cambridge Bay. 1. Whose stroller is this? You should note that this photo was taken around midnight. Why would someone just suddenly abandon a stroller in the middle of their walk? Were they pushing the stroller through the snow, but they suddenly decided that it would be easier to carry the baby in their amauti? Were they going out for a walk, only to suddenly realize they forgot the actual baby, so they left the stroller in the middle of the road and ran back home in a hurry? There is added mystery here because people generally don't use strollers here. The unpaved roads make it impractical. Better to pull your children along behind you on a sled, or stick them in the hood of your jacket. 2. What body part is this? Also, what animal is this? 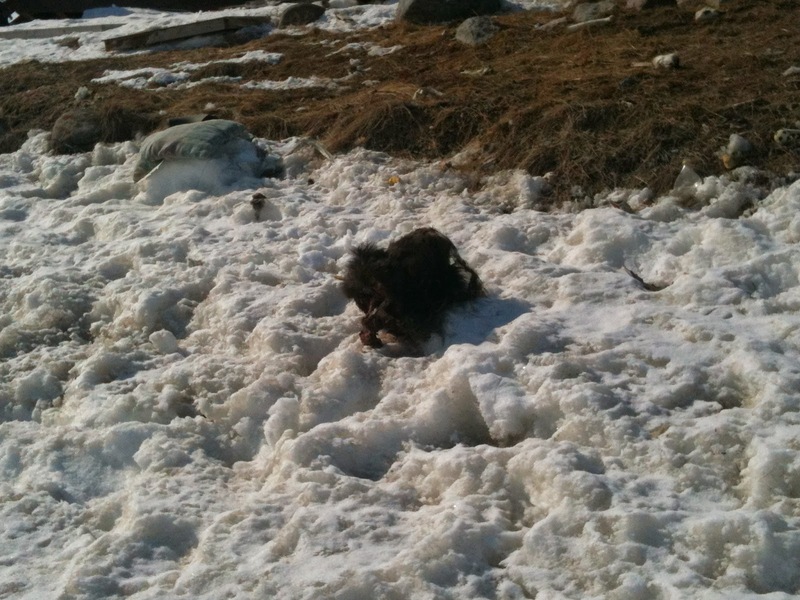 Spring thaw, and the uncovering of all the decaying buried animal carcasses will provide for an interesting smell soon. 3. Is a sundial useful in the Arctic? Science was always my worst subject in class, but I wish I paid better attention so I could ask. How does an Arctic sundial work? In the winter, when there is no sun? In the summer, when there is always sun? Does it work the same way, when the sun is constantly spinning in circles over your head, never going near the horizon? And how about those many, many days when it's cloudy? 4. Did that fox have rabies? Did someone just shoot an Arctic fox in the middle of town right by my office window with all those people around? Yes. I hope it was because the fox had rabies. 5. Behold the litter of Cambridge Bay: a partially eaten leg and an empty bottle of vodka. Here is my question: why wasn't I invited to the party? 6. What's in this box? 8. Make up your own question! I want to tell you a story about how the community worked together to make the high school graduation celebration happen, but first I have to tell you about the weather. On Friday afternoon, the weather report warned of a winter storm watch for the weekend. I should point that it is almost June here. At some point in the year, no matter how chilly the weather gets, it feels inappropriate to label anything "winter". 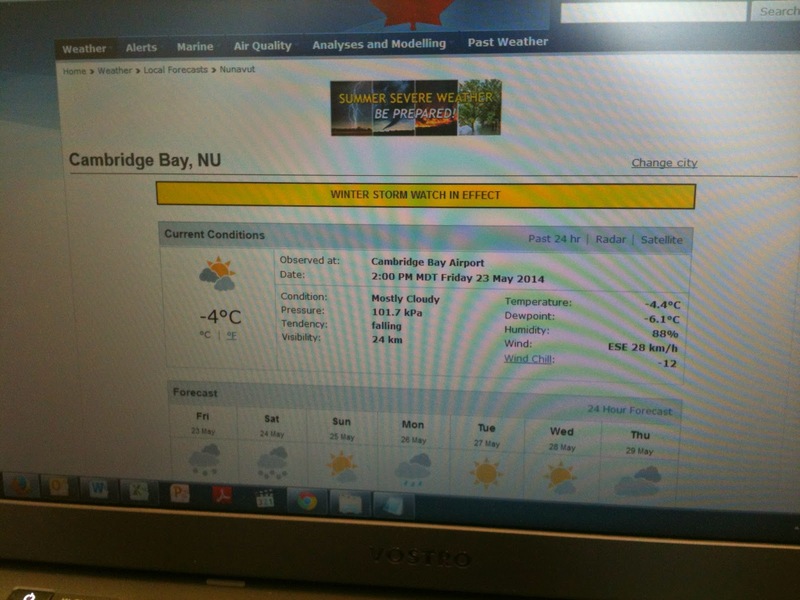 By Saturday, the weather report had updated its status to that of a "snowfall warning". Again, I had to wonder why Canadians would ever need a "warning" about snow, but I didn't put any further thought into it and went on with my day. Meanwhile, the high school class of 2014 was getting ready to graduate, and teachers and volunteers were working around the clock to make sure the occasion would be special. They ordered beautiful flowers and vases to be delivered to decorate the high school gym, and for the graduation dinner, they ordered Subway sandwiches and Chinese food to be delivered by plane from Yellowknife. This was going to be a special exciting treat for the kids who had grown up in a town with no fancy restaurants and only a KFC. The kids debated among themselves whether the after-party would be at someone's cabin or someone's parents' house. Unfortunately, as often happens in the Arctic, the weather got in the way on Saturday and the planes could not land. No vases for the flowers. No Subway sandwiches. No Chinese food. That didn't mean that there was going to be no graduation dinner, however. 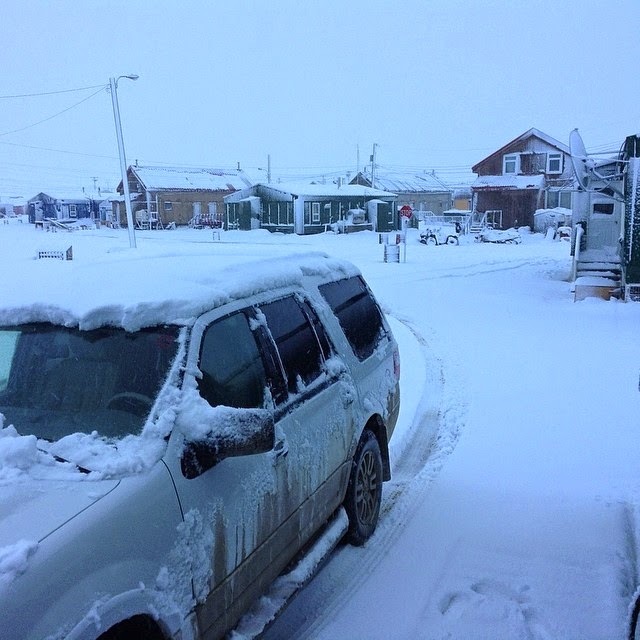 People in Cambridge Bay are determined and quick-thinkers, as you have to be when you live in a harsh environment. A call out was made to the whole community, by phone, by Facebook, by word of mouth at the grocery store, that a potluck dinner was going to happen instead, and food donations to feed some 150 people would be needed - within the next few hours. And then people got to work. Some people made perogies. Another friend made chicken chow mein, so the students could have their chinese food after all. Other friends ground up caribou meat to turn into yummy caribou burgers (cariburgers? Has anyone coined this term yet?). There was also donations of ham, ribs, fried rice, swedish meatballs...it ended up being a whole feast! None of us expected to spend our Saturday this way, especially for a dinner that we weren't planning to attend ourselves, but nobody complained. I certainly didn't expect to spend my Saturday this way - I was feeling a little less than fresh, having stayed up late with friends the night before. But even with the short amount of time that there was until the grad dinner, I managed to throw together a plate of sushi. It wasn't the Chinese food that the students had ordered, but I figured it was pretty close. breathtaking graduation cupcakes from D.
It was really quite beautiful and inspiring to watch the community rally together to make this dinner happen. Many of the volunteer cooks had no direct connections to the school - they weren't teachers, nor were they parents of students, but just members of the community that wanted to support when help was needed. To explain why the grad dinner was just so important to the community though, it's important to understand just what an accomplishment it is to graduate high school here. Obviously it's an important milestone everywhere to get your high school diploma, but there are special challenges in the north that mean, unfortunately, so many kids don't end up getting to that point. The elementary classes are big and full of kids, with multiple classes of twenty or so kids each for every grade. By the time you get to high school, however, a lot of students have dropped out. By grade twelve, this year's graduating class was eleven students. Literacy rates are low in Nunavut, compared to the rest of the country, as well as high school graduation rates. The reasons for this high drop-out rate are too complex for me to speculate about here, but it cannot be ignored that there are extra challenges in education here, less resources, underlying social issues, and so the students who make it all the way through are particularly special, and the whole community comes together to celebrate this. Because the entire community was invited to the high school graduation ceremony, I had the chance to take part (while taking a break from sushi rolling). It was so touching to see the entire community support the graduating high school students, and it was clear just how proud everyone was of these less-than-a-dozen students waiting on the stage. The ceremony began with a special traditional lighting ceremony of the qulliq by a community elder. The students were looking their very best. Cambridge Bay doesn't have a hairstylist in town, but a hairstylist had flown in on a visit with her shears and had done the graduates' hair. The girls were dolled up in their makeup and high heels, starting to look like grown women, and even the boys had taken care to look spiffy, shaving their little mustaches and sporting contact lenses instead of glasses. The graduating students all wore sealskin vests with their graduation gown, a wonderful fusion of north-south traditions. I particularly loved the rainbow theme of the decorations and the ceremony, as the school had decided that this year's theme would be one of tolerance, and they even held a Rainbow Day earlier this month to show their support for the LGBTQ community. It was a proud moment to see the community show their support particularly for the young graduating student Kelsey, who is one of the few open gay people in Cambridge Bay. I'm so glad that I was able to take part, even in the smallest way, in this important occasion here in Cambridge Bay. 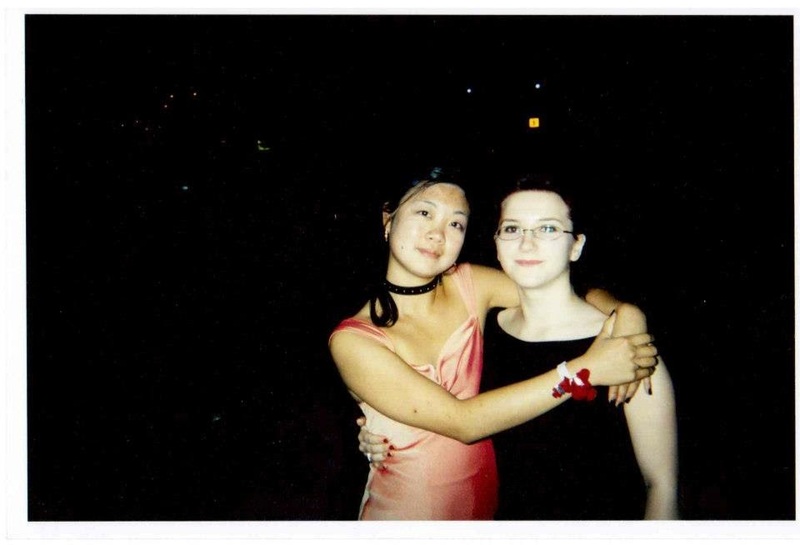 It was really different from my own high school graduation experience, which took place at a theatre hall, in a graduating class of hundreds of students, followed by prom, limos, a catered dinner and an expectation that I would go through at least two more graduation ceremonies further along my academic career. So it was really interesting to see this milestone for a younger generation from a different perspective. It was totally worth sacrificing my afternoon nap. One of the final events for the Omingmak Frolics this year was the Muskox Fleshing Contest. Yup. A competition for cleaning muskox hides, sponsored by the Ekaluktutiak Hunters and Trappers Organization. So northern, right? Obviously I had to check it out. The contest was held out on the ice of the frozen Arctic Ocean, near the snowmobile races. Cleaning the muskox hide basically involves using a knife (often a traditional ulu) to scrape the fat and meat from the skin. It's a long process, especially for a big animal like a muskox. People were judged according to how fast they could work and how clean they could get their hide. Prizes included gallons of gas...so you can take your snowmobiles out and hunt more muskox! My main purpose for the long weekend was to get a suntan. Out on the ice, with pretty much 24 hours of daylight these days, the whole world is one big reflector, and it feels like over the weekend, everyone in town suddenly sprouted suntans. Or, in the case of some of my white friends, sunburns. I figured checking out the Omingmak Frolics snowmobile races being held on the frozen Arctic ocean would be a good chance to get out, see some folks and catch some sun. It's still cold though. It doesn't exactly feel like summer, or at least a southern summer. I mean, it's certainly warmer than -60, but it's still not above zero. On this particular day, it's -14 and people are out in their light jackets. I tried to switch to my "lighter" winter coat (the winter coat I'd wear down south) but was tired of feeling cold in the biting wind and went back to my warm Canada goose parka. It's hard to turn down feeling warm. Watching the snowmobile races sort of has the feel of watching a baseball game. I don't have a vested interest in who is gonna win. I'm more here to enjoy the sights and be a little social...and eat. Except instead of munching on peanuts and crackerjacks like at a baseball game, I'm chowing down on chili and bannock from the canteen to stay warm. Meanwhile, the crowd oohs and ahhs in admiration when the drivers race by on their snowmobiles, expertly leaning into the turns. Somehow, everyone knows which racer is which, even though they all look pretty much the same with their helmets and machines whizzing by in the blur. Being out on the ice makes me crave Beavertails. I did grow up in Ottawa after all, where Beavertails and hot chocolate are every bit a part of the Canal skating experience. Lately though, these cravings have started to be replaced by cravings for Slush puppies, freezies, and other forms of sugary ice. Maybe I'm slowly becoming a Northerner, sucking freezies in the snow. The snowmobile races give the town a great chance to hang out with friends and enjoy the outdoors after a long winter. The kids were pushing their bikes through the snow. Out further in the bay, there was Brent kite skiing, gliding gliding over the ice with enough speed to maybe even give the snowmobilers a run for their money.